*I received this book as an ARC from a teacher! When Elijah sees Kristen sing on stage in her school musical, he knows he needs her to sing in his band. But getting her powerhouse vocals on his stage isn’t as easy as it seems; with the band’s newfound fame comes the online backlash towards Kristen. As the threats escalate from on screen to reality, the band just might be over before it really begins. This book is a must-read for music lovers. Patty Blount creates a captivating story about the dark side of fame and the struggles that artists must go through to achieve their dreams. The dual POV for Kristen and Elijah worked wonderfully, and I liked to see the tweets and twitter stats at the start of each chapter. At first, I didn’t totally love Kristen. She came off as a bit of a stuck up drama kid, but as the story evolved and I got to see the girl behind the act, I realized my misconception at the start. Her relationship with her grandmother, Etta, was touching and I loved how close they are, because I’m extremely close to my grandmother as well. I can confidently say that I stayed up reading (and crying) as I yearned to find out where their story arc would go next. I especially empathized with Kristen when she was dealing with the double standards of being in a heavy metal/rock band. For those of you who haven’t read my reviews about music before, I’m a singer and drummer in my own band. I’m the first to admit that my band hasn’t received nearly as much attention as Ride Out, but I can attest that the standards for girls in bands is a lot higher than boys. My band is currently working on our debut EP, but about a year and a half ago we were in the studio working, and we posted up a picture of me sitting behind my drum set to the Facebook page of the company my cymbals were made at. The company reposted the picture, along with other shots of just the cymbals. Not really any of the comments had to do with me, which was fine; except for one by some random man, who commented something along the lines of the recording studio/drum set being a weird looking kitchen, insinuating that I, a 16 year old girl at the time, shouldn’t have been playing drums. Around the same time, my band took first place at a local battle of the bands, and won some prizes from Fender, some of which were free t-shirts; and a man old enough to be our grandparent felt the need to respond to it claiming that we were the winners of the wet t-shirt contest. One of the things my band tried to avoid is pulling the gender card. We take responsibility for when we lose at battles, but there have been a few times where it was clear that if we had put on the same exact show, but we were boys, we would definitely would have won over the boy band that was chosen over us. What’s the point to this whole rant that at this point you probably don’t think is at all connected to the book? It’s just a few personal examples to show that the online abuse and double standards Kristen must deal with throughout the book aren’t being exaggerated for the plot. Girls are judged much harder than boys, and I applaud the author for her portrayal of it. As much as I love cute band romance stories (because I do!) this book felt raw and real and I loved it. Elijah changed throughout the book as well, especially from the start when he thought nothing of how his comments actually effected Kristen and how others viewed her, apart from any publicity being good publicity. I think this summed up how some guys think, in terms of not taking threats seriously, or brushing off Kristen’s concerns about the comments she was receiving online. His relationship with his younger sister, Anna, who is on the autism spectrum was portrayed well. It was nice to see the contrast in how he acted when he was playing a role versus how he acted when he was himself, which was around Anna. While I would love to continue reading about Kristen and Elijah’s story, I felt the end was a satisfying conclusion to a great story. I also felt that Elijah and Kris’s relationship developed nicely and didn’t feel rushed, which can be the case in young adult novels. The symbolism behind the title of the book is also made clear, and as a reader I love it when the title has a greater meaning than just words a marketing team thought would attract buyers. Overall, I felt that this book tackled current issues in a respectful way, and explored both the negative and positive effects of social media and the internet. The inclusion of personal family struggles for both main characters helped to make them feel more real and flushed out, and this book is so much more than just a story about a band trying to make it big. This book will be released on August 1, so please make sure you preorder it now! The links are included down below. 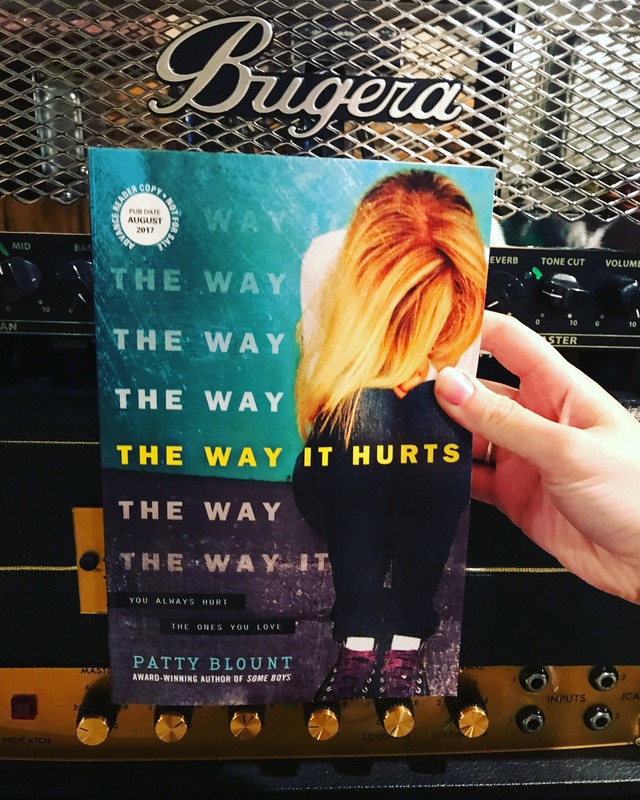 PREORDER ‘THE WAY IT HURTS’! Connect with the author! You can follow Patty Blount on Instagram at @pattyblount3 and on Twitter at @pattyblount!